A former college golfer for Texas A&M, Scott Fawcett's professional golf career never went as far as he wanted it to. An appearance in the 1999 U.S. Open and stints on the Web.com and Hooters Tours, among others, led Fawcett to create a new strategy to help take his own game to the next level. By combining shot distribution patterns and PGA Tour scoring statistics, the DECADE Course Management System was born. DECADE — which stands for Distance, Expectation, Correct Target, Analyze, Discipline, Execute — has quickly become a revolutionary way to approach the game. After helping a junior golfer find success, Fawcett's system gained a lot of attention and has since boomed. College coaches began hiring Fawcett to teach their golfers his system, and he has even been asked to help some PGA Tour players. The DECADE system became so effective that the NCAA banned Fawcett from teaching his seminar, considering it an "unfair competitive advantage." Fawcett lives in Dallas where he runs an electricity company he started in 2002 while sidelined with an injury, in addition to his golf life. He has caddied for many PGA Tour and amateur players since the creation of DECADE, such as Martin Flores, Beau Hossler and Sam Burns. We talked with Scott this week about his company and its impact on college golf. 1. Scott, take us back briefly into your own golf career. You spend a significant amount of time working with college players. Did you play college golf and where? What type of player were you? What about professional golf? How long did you play professionally and to what level? I played for Texas A&M, graduating in 1996. I was never nearly as good as I thought I was while in college. So naturally I turned professional when I graduated, even though I never had any real success in college. I always told myself once I can get rid of my schoolwork, I'll be able to devote more time to my game. I played professionally from 1996-2001 winning several times on the Hooters Tour and other random mini-tours. I never made it to the final stage of Q-School in four tries. I then started an electricity company when Texas deregulated its electricity market in 2002. I still own and run that company today. In 2008, I decided to play more competitive amateur golf and decided to give Q-School one more shot as a 35-year-old amateur. I made it to the final stage and played sparingly the next season on the Web.com tour. I then regained my amateur status again in 2013. 2. You often reference your own golf career as a driving force for creating DECADE. Walk us through how and why you created a game management system unlike anything golf has seen before. 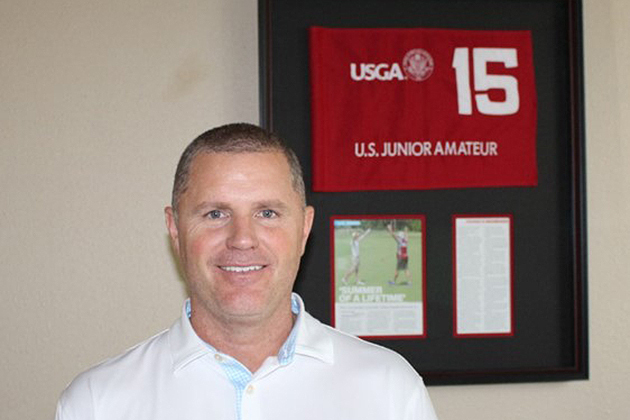 When I regained my amateur status in 2013, I wanted to keep my game sharp for the U.S. Mid-Am. Around that time Mark Broadie's book, "Every Shot Counts" was beginning to be marketed. A few excerpts I read made me really start considering strategy and its implications at the highest level. I realized I could create a spreadsheet combining shot patterns and expectations from various results and in theory solve golf strategy mathematically. I spent several months creating DECADE but was sidelined with an injury when it came time to put it to use in the summer of 2014. As a result, I caddied for a junior golfer from my home course to test out the theories in a few events. He won the Texas Amateur and the U.S. Junior while I was caddying for him. 3. You started giving seminars to college teams several years ago. Any particular reasons you think this particular group of elite players have locked onto what you are teaching? What are some of the most common questions you get from your collegiate clients? Several top college coaches asked me what I was teaching that junior in 2014, as his game made an overnight leap, and if I could teach it to their team. The NCAA originally said that if I hosted my seminar indoors, I would be considered a mental coach. So, I created a several-hour seminar to teach the ideas to college golfers. I think the reason that collegians have latched on so well is the simple fact that golf is a very difficult game to learn how to play well. You get very little feedback about the actual quality of a golf shot on a driving range. On the course, you see the same situation so rarely that it's hard to learn your lesson even when you make an obvious mistake. Teaching strategy in an emotionless environment, either via my live seminar or the DECADE app, is a far more efficient way to teach the game. I know it seems odd to teach a player how to golf while not playing golf, but it truly is the best way to go about it. 4. College golf is considered a prime stepping stone onto the Web.com and PGA Tours today. As your college players finish their school careers, are most continuing with the program as they turn professional? Does the system or your approach in teaching it change as a player starts to play for a living? Quite a few players continue on with me, and many that I didn't work with in college reach out to me very quickly if they struggle initially. The system doesn't change necessarily, but it does get more detailed. By having a caddie in the mix, I'm able to give quite a bit more information for them to look for during a round. 5. It is well known that whatever successful college players are using in the way of equipment, teaching philosophies, etc., will drip down to junior golfers who aspire to play collegiately. Are you seeing younger players gravitating to the system? Are teenage players disciplined enough to benefit from DECADE? What are some of the common questions you hear from this age group? Shoot, I don't think professionals are disciplined enough! In all seriousness, though, no they aren't disciplined enough in general. However, having the information can only help them become better, more disciplined players than they were previously. I focus intensely on the words patience and discipline in my seminar and video content. That is the name of the game in my opinion. 6. Did you ever imagine DECADE taking off as it has? If you had to guess, how many of the top 100 ranked men's college players in the country last school year were using some level of DECADE? No, I didn't imagine this at all. I truly created DECADE for my game. I had no intention or notion that it would find a spot in the game being so underserved. Golf is simply a very hard game to teach people to play correctly. I believe DECADE simply found a better and quantified way to teach the game. To be honest, if the NCAA hadn't required that my seminar be taught indoors, it never would have crossed my mind to do it in this format. 7. Finally, what is next for Scott Fawcett? Any new projects with DECADE or its application on the horizon? Next up is hopefully more golf for me! I've spent the last few summers helping that same junior from 2014 in a few golf tournaments each summer. As a result, I haven't played very much golf personally. I hope to change that with a few more golf tournaments in 2018. Although with a growing stable of PGA Tour players, I'm not sure I'll find the time to really work on my game — time will tell!